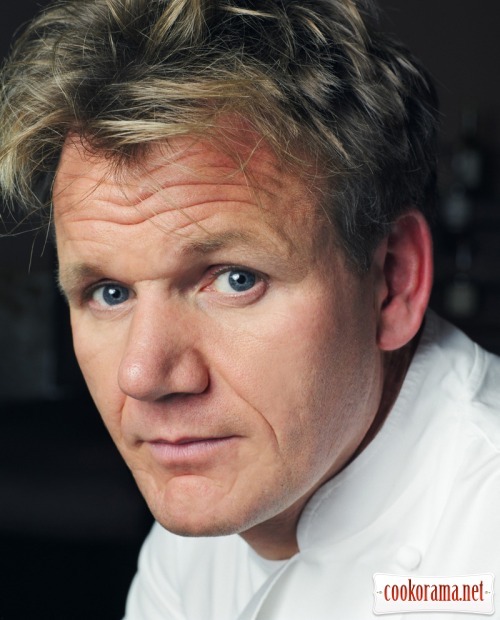 Gordon James Ramsay — British chef of a Scottish origin, known as the first Scot awarded with three Michelin stars. Popular host of the British TV show The F-Word, Ramsay’s Kitchen Nightmares и Hell’s Kitchen, and also their American television twins. I saw this recipe in one of such shows. I can say one thing: it was tasty! 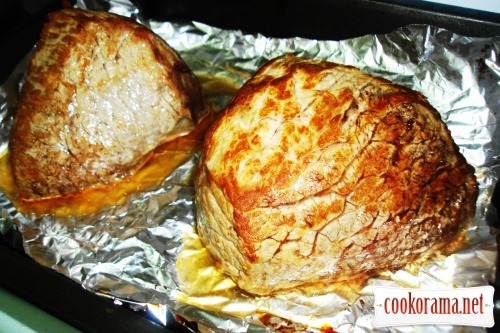 Heat the oven at 220℃. 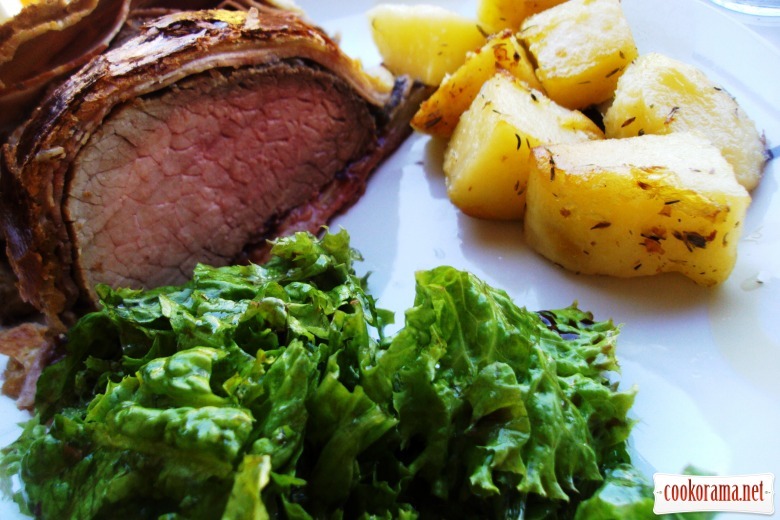 Grease the fillet of beef with olive oil and bake on a dry heated pan till crisp, for 2 min from each side. Spread the fillet on a pan and bake for 15-20 min. 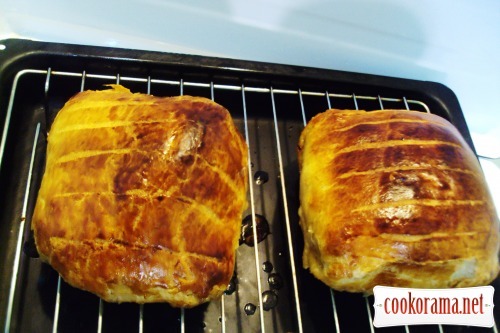 Cool in the fridge for 20 min. 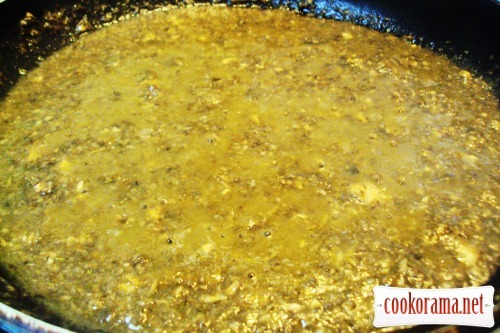 Grease the cooled meat with mustard. 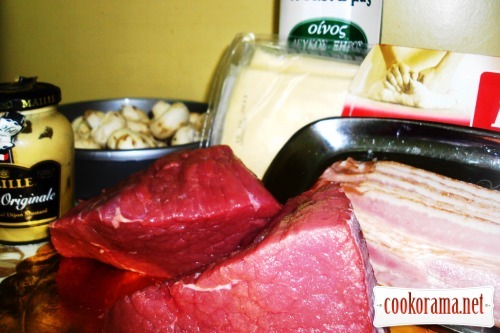 While the meat is cooling, wipe mushrooms with a damp paper towel and mix in a blender. Heat 2 tbsp of oil in a big pan and fry mushrooms on a middle heat for 10 min with a sprig of thyme, often stirring. Add wine and cook for 10 min, to evaporate the liquid. Add salt, pepper. Cool it. 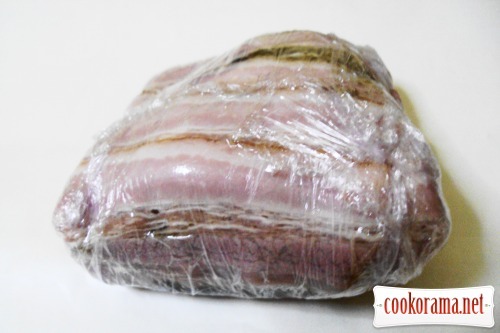 Cover the board with a cooking paper, on which lay overlapping strips of bacon. 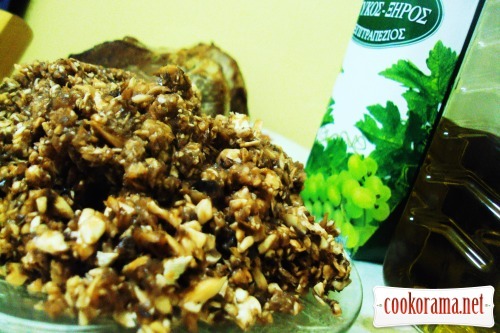 Put a layer of a mushroom mixture. 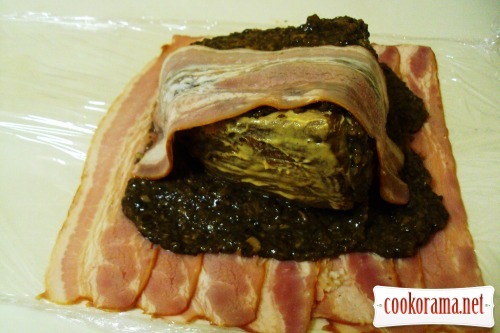 Put a fillet and cover it with mushrooms and bacon. 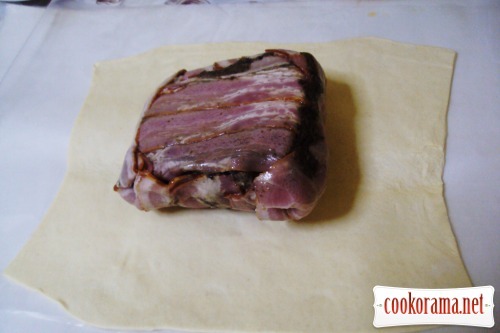 Make a roll (the meat should be completely wrapped in bacon). Cool in the fridge for 20 min. Put a fillet on the loaf. 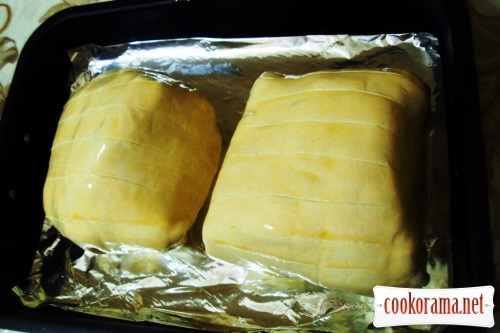 Wrap the loaf and place on a baking sheet seam down. Grease with yolk mixed with water. And make along cuts, not cutting dough. In such way roll can be kept in the fridge from 30 min till 24 hours. Heat the oven at 200℃. 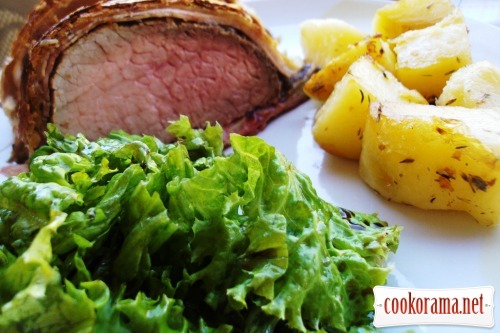 Bake till golden color and the readiness of the meat you wish: 20-25 min – with blood, 30 minutes for an average degree of baking, and 40 min till readiness (depends from your oven). Give it to stay for 10 min before serving. 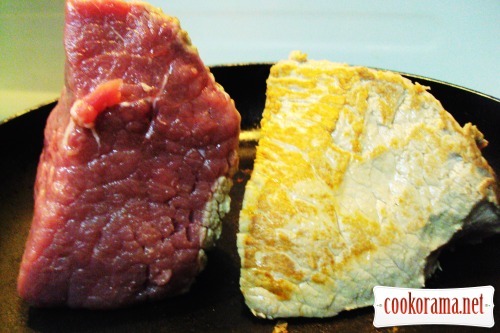 Cut the ready meat into thick slices. 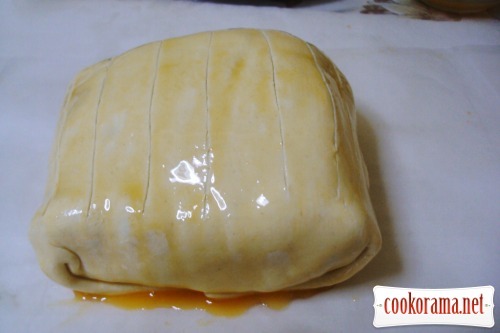 Top of recipe "BEEF WELLINGTON by Gordon Ramsay"